Agnolo di Cosimo (November 17, 1503 – November 23, 1572), usually known as Il Bronzino, or Agnolo Bronzino, was an Italian Mannerist painter from Florence. His sobriquet, Bronzino, in all probability refers to his relatively dark skin. Bronzino was born in Florence, the son of a butcher. According to his contemporary Vasari, Bronzino was a pupil first of Raffaellino del Garbo, and then of Pontormo, to whom he was apprenticed at 14. Pontormo is thought to have introduced a portrait of Bronzino as a child (seated on a step) into one of his series on Joseph in Egypt now in the National Gallery, London. Pontormo exercised a dominant influence on Bronzino's developing style, and the two were to remain collaborators for most of the former's life. An early example of Bronzino's hand has often been detected in the Capponi Chapel in the church of Santa Felicita by the Ponte Vecchio in Florence. Pontormo designed the interior and executed the altarpiece, the masterly Deposition from the Cross and the sidewall fresco Annunciation. Bronzino apparently was assigned the frescoes on the dome, which however have not survived. Of the four empanelled tondi or roundels depicting each of the evangelists, two were said by Vasari to have been painted by Bronzino. His style however is so similar to his master's that scholars still debate the specific attributions. Towards the end of his life, Bronzino took a prominent part in the activities of the Florentine Accademia delle Arti del Disegno, of which he was a founding member in 1563. The painter Alessandro Allori was his favourite pupil, and Bronzino was living in the Allori family house at the time of his death in Florence in 1572 (Alessandro was also the father of Cristofano Allori). Bronzino spent the majority of his career in Florence. Bronzino first received Medici patronage in 1539, when he was one of the many artists chosen to execute the elaborate decorations for the wedding of Cosimo I de' Medici to Eleonora di Toledo, daughter of the Viceroy of Naples. It was not long before he became, and remained for most of his career, the official court painter of the Duke and his court. His portrait figures—often read as static, elegant, and stylish exemplars of unemotional haughtiness and assurance—influenced the course of European court portraiture for a century. These well known paintings exist in many workshop versions and copies. In addition to images of the Florentine elite, Bronzino also painted idealized portraits of the poets Dante (c. 1530, now in Washington, DC) and Petrarch. Bronzino's best known works comprise the aforementioned series of the duke and duchess, Cosimo and Eleonora, and figures of their court such as Bartolomeo Panciatichi and his wife Lucrezia. These paintings, especially those of the duchess, are known for their minute attention to the detail of her costume, which almost takes on a personality of its own in the image at right. Here the Duchess is pictured with her second son Giovanni, who died of malaria in 1562, along with his mother; however it is the sumptuous fabric of the dress that takes up more space on the canvas than either of the sitters. Indeed, the dress itself has been the object of some scholarly debate. The elaborate gown has been rumored to be so beloved by the duchess that she was ultimately buried in it; when this myth was debunked, others suggested that perhaps the garment never existed at all and Bronzino invented the entire thing, perhaps working only from a fabric swatch. In any case, this picture was reproduced over and over by Bronzino and his shop, becoming one of the most iconic images of the duchess. 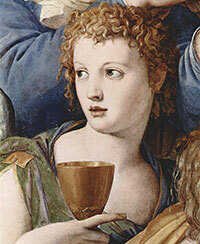 The version pictured here is in the Uffizi Gallery, and is one of the finest surviving examples. 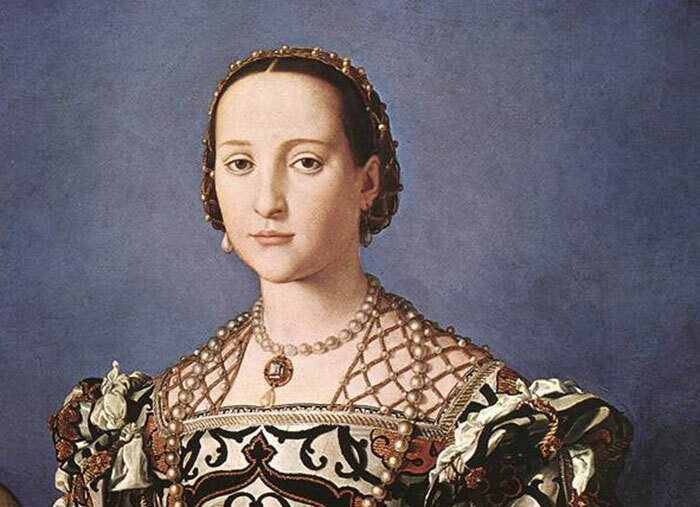 Daughter of viceroy of Naples Don Pedro di Toledo, Eleonora married Cosimo I de' Medici in 1539 and died in 1562. In this picture, datable around 1545, she is portrayed with one of their eight sons, the young John, born in 1543 and died, as his mother of malaria, in 1562. The intense blue of the background and the stateliness of the figure enhance the preciousness of Eleonora's dress (for long time, erroneously believed her sepulture cloth), while her aristocratic beauty betrays a sense of melancholy. It was painted towards 1545, at the happiest moment of Bronzino's activity as a portrait painter. The diligent and frankly enjoyed description of the details of the costume are transfigured, through the geometrical simplification and the calm fixity of the light, into a vision of an almost ecstatic detachment. Archeological work in the tomb of Eleonora, the wife of Cosimo I de' Medici, has revealed fragments of the dress worn in this portrait. The Crossing of the Red Sea occupies the whole left wall of the chapel called "of Eleonora of Toledo", in on second floor of the palace, which was frescoed by Bronzino for the Grand Duchess in 1540-1545. The Biblical scene is depicted with the use of large figures which, seen from very near, gives the impression of an icy splendour, corroborated by the vivid colours. Some of the figures are clearly inspired by Michelangelo or Pontormo, as well as by the ancient statue sculpture. In particular, the foreground man on the left is a reproduction of the bronze Idolino (now in the Archaeological museum of Florence). Elizabeth Pilliod, Pontormo, Bronzino, and Allori: A Genealogy of Florentine Art (New Haven, CT: Yale University Press, 2001). Maurice Brock, Bronzino (Paris: Flammarion; London: Thames & Hudson, 2002). Deborah, Parker, Bronzino: Renaissance Painter as Poet (Cambridge and New York: Cambridge University Press, 2000). Janet Cox-Rearick, Bronzino's Chapel of Eleonora in the Palazzo Vecchio (Berkeley: University of California Press, 1993). "Bronzino and The Mannerist Portrait". Smarthistory at Khan Academy. Retrieved January 6, 2013. 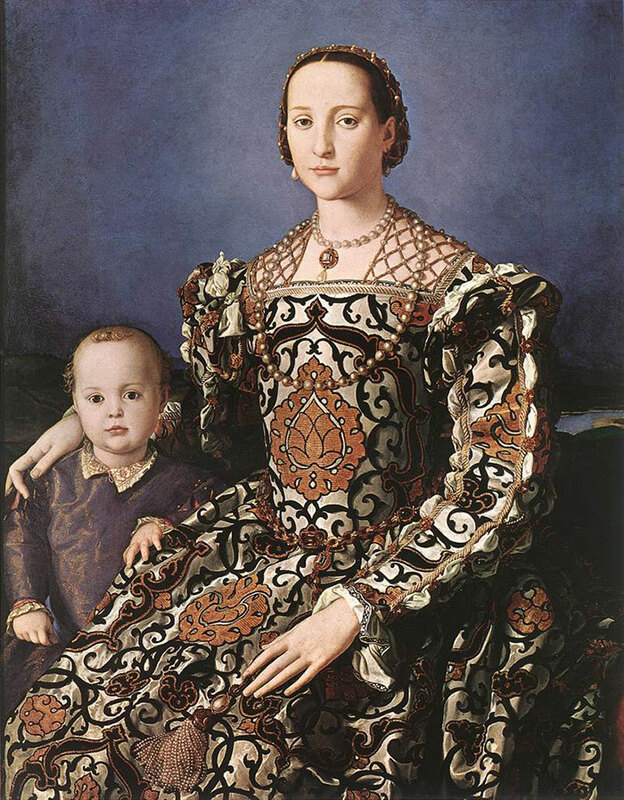 "Bronzino's Portrait of Eleonora di Toledo with her son Giovanni". Smarthistory at Khan Academy. Retrieved January 6, 2013. Bronzino: pittore e poeta alla corte dei Medici, exh. cat. ed. by Antonio Natali e Carlo Falciani, Palazzo Strozzi, Florence 2010-11. ISBN 978-88-7461-153-9.
published under the GNU Free Documentation License. 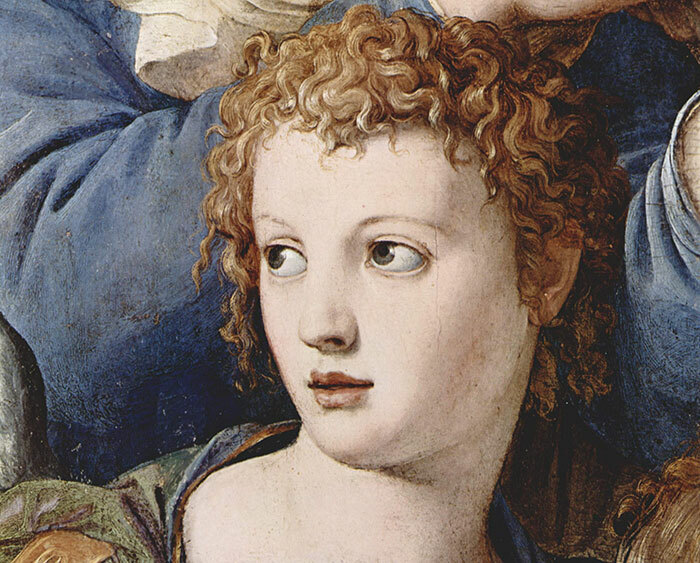 Wikimedia Commons has media related to Angelo Bronzino and Cappella di Eleonora. Podere Santa Pia is an authentic holiday home in Castiglioncello Bandini, a small village in the Maremma, in the south of Tuscany, situated half way between Florence and Rome and close to Montalcino, Arcidosso and Monte Amiata. The house and the apartment of Podere Santa Pia are the ideal place for couples who want to relax in tranquility. Set on a hill in the lush Tuscan countryside, Podere Santa Pia overlooks nearby medieval hilltop towns, vineyards, and olive groves, and, in the distance, the Tyrrhenian Sea with the islands of Montecristo and Corsica in the distance. 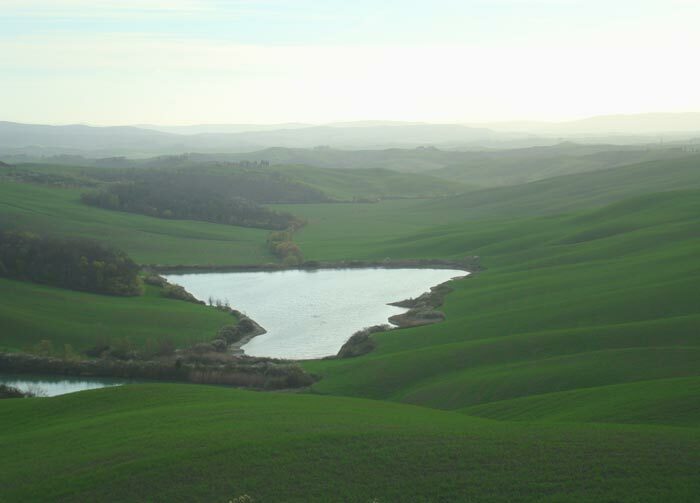 Florence is easily reachable from the main railway station in Grosseto or by bus (Paganico).